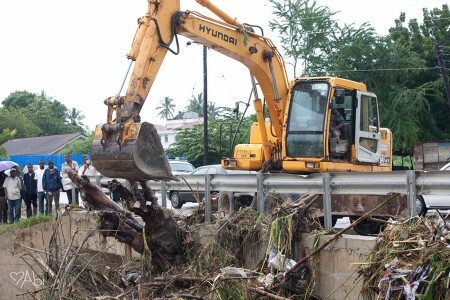 Cleanup crews at work removing debris in Mbezi Beach last Friday. Photo contributed: Abigail Snyder. While touring flood damaged zones around Dar es Salaam on Thursday, President Jakaya Kikwete criticized the Kinondoni Municipal Council for their inaction on removing the floodwater. “These people need to continue with their lives. It’s disappointing to see this situation after all these days,” says Kikwete, noting that the lack of action makes the government look bad in the eyes of the public. Kikwete says local council leaders must take appropriate measures to insure the situation normalizes, insisting that standing water should be pumped out immediately. “I am giving the order from this moment that water must be pumped out of these houses, we have engineers here, you know what to do,” says Kikwete, speaking about the situation in Basihaya (Tegeta) where over 200 homes remain submerged. Proper drainage must then be constructed in the area to prevent future flooding, he says.